PALM BEACH, Fla. – March. 23, 2018 – Barrett-Jackson, The World’s Greatest Collector Car Auctions®, continues to build a spectacular lineup for the 2018 Palm Beach Auction with the addition of the South Florida Collection. 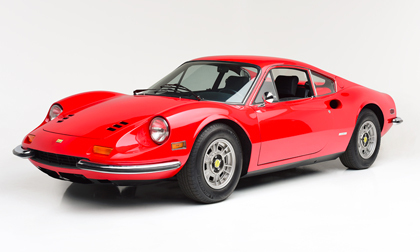 Included in the nearly all No Reserve collection that will cross the block during the 16th Annual Auction April 12-15, 2018 at the South Florida Fairgrounds, are a pair of Ferraris highlighted by a 1972 Ferrari Dino 246 GT. Headlining the South Florida Collection is a 1972 Ferrari Dino 246 GT (Lot #722) with an outstanding nut-and-bolt restoration. Finished in Rosso over black, it features a 2.6-liter engine and 5-speed manual transmission. Also included in the collection is a white 1983 Ferrari 512 BBi (Lot #723) powered by a 4.9-liter, 12-cylinder engine with a 5-speed manual transmission. The Vehicle Docket for the 2018 Palm Beach Auction, along with additional event details, are now available at Barrett-Jackson.com. For more information on becoming a bidder for the 2018 Palm Beach Auction, including the John Staluppi Cars of Dreams Collection and the South Florida Collection, follow the link to www.Barrett-Jackson.com/bid. To submit an application to consign at the 2018 Palm Beach Auction, click here.